August has been an exciting month in Camden’s vocations office. It started at the end of July when The Press of Atlantic City featured our seminarians Paul Abbruscato and Deacon Edward Kennedy, noting the increase in seminarians we have seen over the past couple of years. 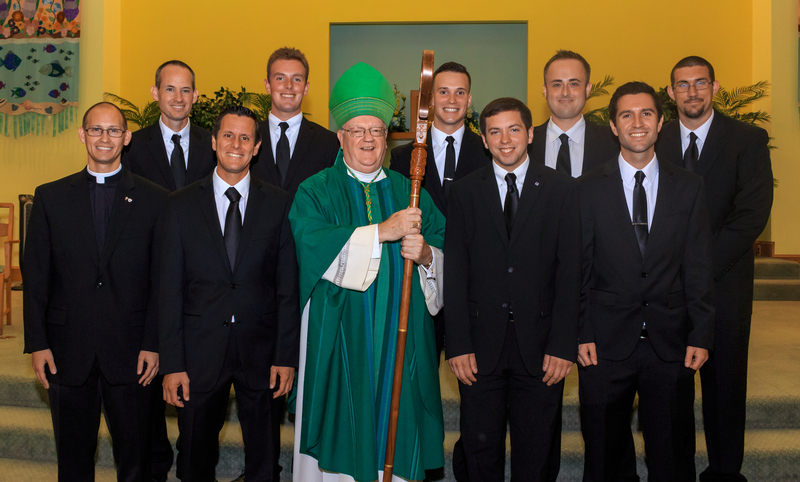 In fact, Bishop Sullivan accepted nine seminarians into our formation program this year, the largest incoming group for our diocese since the year 2000 (which was the year I entered the seminary). 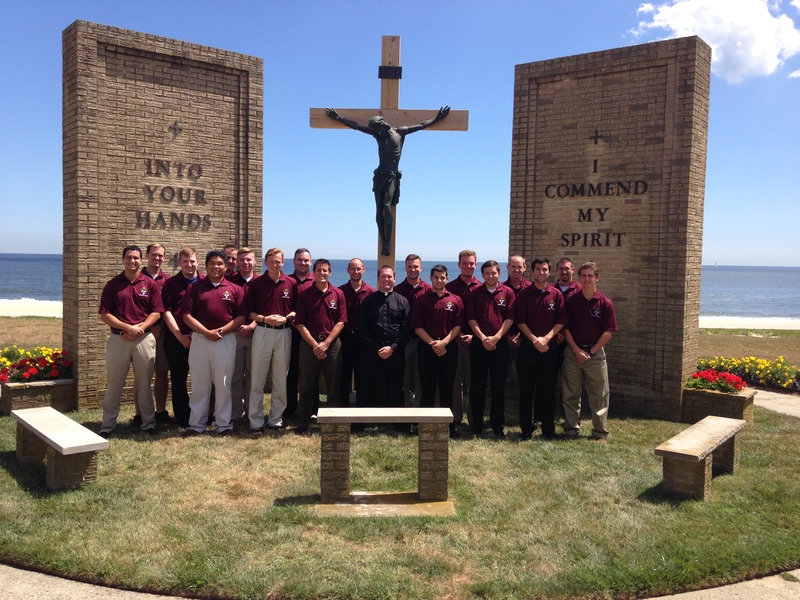 On Sunday, August 9, we had our annual Mass accepting new seminarians at Christ the Redeemer Parish in Atco. The nine new seminarians and their families joined the nine returning seminarians and their parents for Mass and brunch before posing for group and individual pictures for our website, etc. It was a wonderful day, with Bishop Sullivan reminding the men to seek Christ in the ordinary moments of their day rather than expecting to find him only in the extraordinary. Following Mass, the 18 seminarians and I went up to San Alfonso Retreat House in Longbranch for some days of prayer and fraternity. 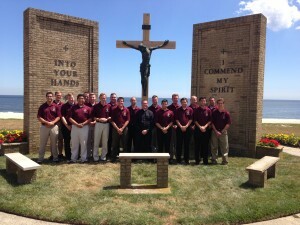 The friendship between our seminarians was so apparent that week; I found it both hopeful and inspiring. The highlight of the time together was the presence of Archbishop Bernard Hebda, who used his talks to speak about the upcoming Jubilee of Mercy and what that means in the life of a seminarian. Those talks and beautiful beach weather made for a great week. 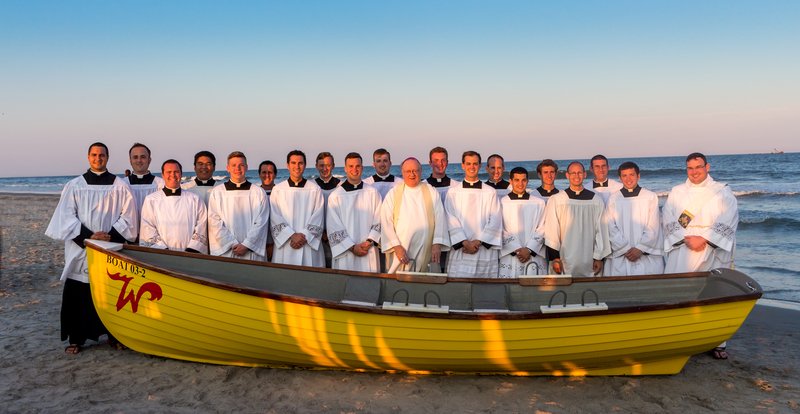 After leaving San Alfonso, the seminarians joined Bishop Sullivan for the annual Wedding of the Sea in Wildwood and Atlantic City. 18 seminarians crossing the Wildwood Boardwalk on a Friday evening was certainly a different sight! I can only hope that their presence and joy made some of the other young men who were present ask themselves how open they are to the Lord’s will in their life. Our men then had some time for themselves to finish packing and preparing for a new school year. At this point, each of them are now back in the seminary (1 at Saint Mary’s in Baltimore, 7 at Immaculate Conception Seminary in South Orange, 9 at Saint Andrew’s College Seminary in South Orange, and 1 on his pastoral year at Saint Andrew’s in Gibbsboro). For the new men, these are days of adjustment to a new house, new routine, new way of life, etc. For the returning men, these are days of catching up with old friends and settling in to their second home. The next time they will all be together is for a Christmas party with the bishop and some discernment events in January. I look forward to that. I have been asking the people in our diocese to pray daily for an increase in priestly vocations for our diocese, and I am grateful for those prayers. This recent uptick in numbers is encouraging and comes very much as the fruit of everyone’s prayers, especially through our First Thursday Holy Hours and the prayers raised at iRace4Vocations. And yet, we cannot get complacent. 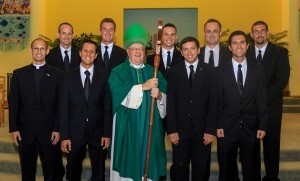 Please, pray for our current seminarians and their perseverance. But also, continue to pray with me daily that the Lord bless us with more seminarians in the years ahead. For now, the work goes on as we prepare for High School Vocations Awareness Days, Discernment Group Meetings, First Thursday Holy Hours for Vocations and our 5th annual iRace4Vocations. The highlight of this academic year, though, will be the ordination the transitional diaconate on May 14 and the ordination to the priesthood on May 21. This certainly is an exciting time. Father Michael Romano is the Director of Vocations for the Diocese of Camden and serves as the Priest Secretary to Bishop Sullivan.